This excursion will explore the role of glaciers, glacial meltwaters and post-glacial slope processes in creating and modifying parts of typical catchments of tributaries of the River Tweed. The Eddleston Water is a major southward flowing tributary and we will visit a typical lowland strath within the middle reaches of the valley, examining some of the evidence for and against the former presence of an ice-dammed lake in the valley floor. The Talla Water valley represents the headwaters of a typical minor upland tributary. The excursion will also visit hummocky moraines, evidence that suggests renewed glaciation during the Loch Lomond Stadial about 11,000 years ago. The aims of the excursion will be to examine the role of glaciers, glacial meltwaters and post-glacial slope processes in creating and modifying parts of typical catchments of tributaries of the River Tweed. The Eddleston Water is a major southward flowing tributary and the excursion will visit a typical lowland strath within the middle reaches of the valley. The excursion will examine some of the evidence for and against the former presence of an ice-dammed lake in the valley floor. The Talla Water valley represents the headwaters of a typical of minor upland tributary of the Tweed. The excursion will visit hummocky moraines (typical of evidence used to suggest renewed glaciation of the parts of the Southern Uplands during the Loch Lomond Stadial at c. 11-10, 000 years BP). Waterloo Pl. (09.00)→ Comiston Rd. [waterworks] (09.20) → Scots Pine Café Eddleston (10.00) → Black/White Meldon lunch stop (12.30) →Car park between Talla Linnfoots and Megget Stone (13.45) leave Talla at c 16.00. This is a provisional programme subject to agreeing access and may change. By coach to Shiplaw Burn area, brief stop to look at peat filled kettle holes in ice-contact glaciofluvial gravels. Return by coach to Eddleston village and via minor road through Hattonknowe, and Wormiston to view major glacial meltwater channel systems cut into glacial sediments and bedrock, before reaching picnic sites (lunch stop) amongst hut circles between Black Meldon and White Meldon. Join the A 72 and south onto the B 712 to travel southwest past Stobo and Drumelzier to join the A701 towards Tweedsmuir and via minor road east past the Talla reservoir to park the coach at the car parking area at NGR [NT 143 202], across the bridge from the waterfalls c. 1 km SW from Talla Linnfoots. Proceed on foot along the metalled track next to the Talla Water and then across moorland to view the Hummocky Moraines in the upper part of the Talla Water valley. This will take c. 2 hours, before departing by coach at c. 4pm to return to Edinbugh. Eddleston water area, flat farmland tracks, major A road and minor tarmac roads. Distance: Scots Pine Café → gravel pit and return (Maximum 2.2 km Elevation change max. c 20 m.
Comprising: 1.5 km metalled track c 30 m rise in elevation; moorland peat and hillside c. 3.5 km c. 120 m rise in elevation Total rise in elevation c. 150 m (The moorland peat and hill slope can be very wet and uneven under foot). 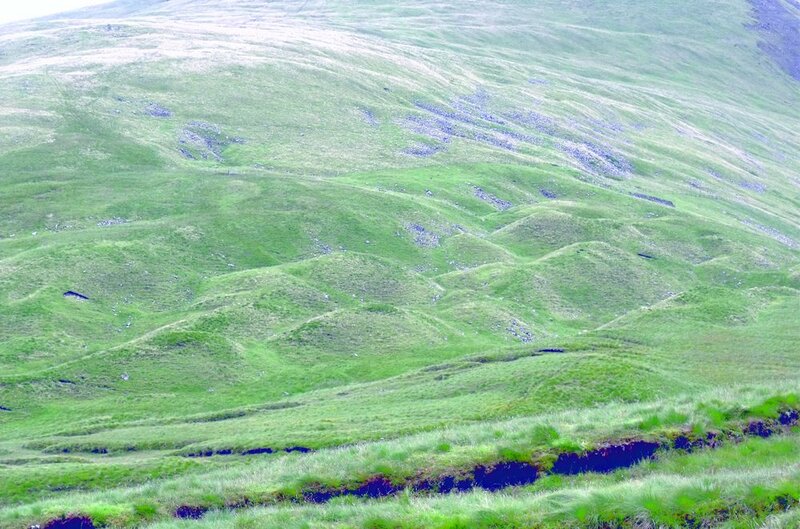 Weather: may be wet and very windy especially in the Talla catchment area; Rough and Steep Ground (in the Talla area) the Talla catchment site lies between c. 400m and c. 550 m AOD and is surrounded by mountains at c 800 m AOD. Particular care must be taken in crossing and walking alongside the busy A703, which is the main Edinburgh to Pebbles road. The excursion will try to minimise walking along the A703 by (if possible dropping the party close to the disused quarry from the coach) and then crossing the road to walk southwards to the Scots Pine Café along the former disused railway line (alongside the Eddleston Water) though grassland. Wet weather clothing (including over trousers) are required to be carried especially for the Talla portion of the excursion. Stout walking boots or wellingtons are necessary especially for the Talla area. Sissons J. 1958. Supposed ice-dammed lakes in Britain with particular reference to the Eddleston valley, southern Scotland. Geografiska Annaler: 159-187. Sissons JB. 1967. The evolution of Scotland’s scenery. Oliver and Boy: Edinburgh and London.